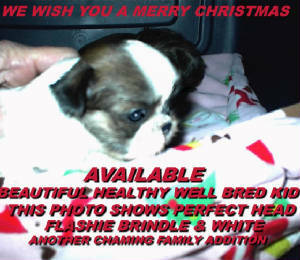 WE HAVE [ 4 ]PUPPIES AVAILABLE RIGHT NOW .SIRE IS OUR SWEET STUD BOY BANDIDO BEN OF BEACHVIEW & OUR BEAUTIFUL MOMMA IS OUR DOLL BABY- STARZ SUMMER BREEZE OF TORI - BABIES WERE BORN 11-9-2018 - WE HAVE BABIES AVAILABLE FOR DEPOSIT.Call Jeri at 219-939-8755-Only Phone Contacts will be added to The Puppy Wish List.It would be advisable for phone cleared interested parties to deposit there puppy in advance,to secure your Baby before they are gone . 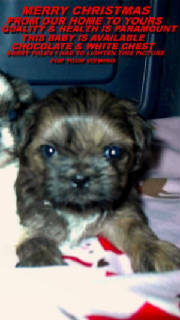 Our babies are Pre-Spoiled and very social.They go to there new families with the following :They are Vet. 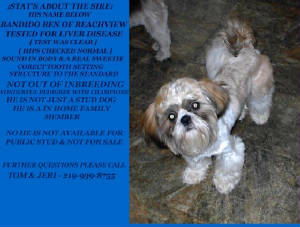 Checked for Good Health - Proper puppy registration Applications [ Puppy Papers &] ;Pedigree Of Lineage Paperwork & Guarantee in Contract Form for our new families benefit Primarily - Vaccinated According to Age -Wormed - Are Grooming Table Trained & Started On Groomings.They are a blessing for a groomer when they leave us.I offer Grooming for individuals who own Shih Tzu's From Our Breeding Program Only.They are my little fur baby dolls so I do not want them mishandled by a Over Booked Grooming Salon.My babies are fairly priced On Limited Reg.-Boys are 1200.00 & Girls are 1400.00.I Will Not Fly A Shih Tzu Puppy ,So Don't Ask.If I can't meet you I won't sell to you.Breeding Priveleges are an option only on a Co-Ownership Contract with Special Conditions.For those whom have The Breeds Best Interest At Heart .My babies are also not the product of Inbred Dogs.I am not a snotty breeder ,but I do not want my babies used to suppliment a buyers family income & bred to death.I Do Not sell to pet stores or puppy mill situations. 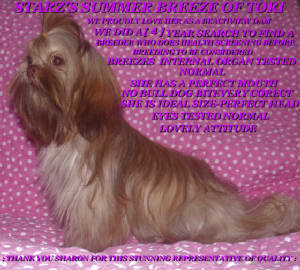 Tori Kennels Presents - BeachView Del Tori V Shih Tzu Puppies www.torigsd.com Updated On 12-15-2018 Nothing from these pages maybe use without written express permission from Tori German Shepherds.